"There is bad news to come regarding Social Security - not merely for the "1 percenters" but for ordinary Americans, who must either pay more to Social Security or receive less from it. 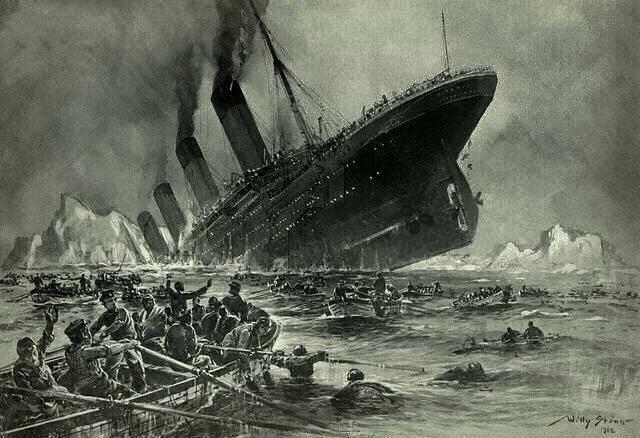 Expanding Social Security, as some of members of Congress have proposed, isn't rearranging the deck chairs on the Titanic. It is like adding more passengers." Robert Pozen is a nonresident senior fellow in Economic Studies at the Brookings Institution. Since 2004, he has served as the chairman of MFS Investment Management, which manages over $180 billion in assets for over five million investors worldwide. Prior to this position, he was the John Olin Visiting Professor at Harvard Law School in 2002 and 2003, where he taught interdisciplinary courses on corporate governance and financial institutions. He currently serves as a senior lecturer at the Harvard Business School. Read more! "Examining the New Income Measures in the Current Population Survey"
The U.S. Census Bureau’s Current Population Survey (CPS) is a primary source of income data for those whose ages are associated with being retired. In response to research showing that the survey has misclassified and underreported certain types of income, the 2014 CPS included a redesigned set of questions aimed at better capturing income from individual retirement accounts (IRAs) and 401(k)-type plans, among other goals. This paper provides a comparison of the income levels from the redesigned questions with those from the traditional questions. The focus in this paper is on the income of those ages 65 or older and on the income categories associated with retiree income to see the impact of the changes in the questions on sources of income in retirement. Particular emphasis is given to the income from individual retirement accounts (IRAs) and 401(k)-type plans, as this appears to be the income type with the most underreporting, given the lump-sum nature of the payments typically found from these plans, instead of regular annuity payments traditionally received from pensions. This analysis finds the new measure of income in the CPS identifies significantly more income (and a much larger percentage of income) coming from IRAs and 401(k)-type plans. Compared with the estimated amount under the traditional-income questions for 2013, the redesigned questions have resulted in an estimated total annual income 9.1 percent larger for those ages 65 or older, an aggregate amount of almost an additional $133 billion. Retirement income is 27.9 percent larger, an aggregate difference of almost $71 billion. However, Social Security remains the overwhelmingly predominant source of income for those ages 65 or older. The redesigned CPS still finds that over 60 percent of individuals in the two lowest-income quartiles receive more than 90 percent of their total income from Social Security. "Longevity Shocks with Age-Dependent Productivity Growth"
The aim of this paper is to study the long-run effects of a longevity increase on individual decisions about education and retirement, taking macroeconomic repercussions through endogenous factor prices and the pension system into account. We build a model of a closed economy inhabited by overlapping generations of finitely-lived individuals whose labour productivity depends on their age through the build-up of labour market experience and the depreciation of human capital. We make two contributions to the literature on the macroeconomics of population ageing. First we show that it is important to recognize that a longer life need not imply a more productive life and that this matters for the affordability of an unfunded pension system. Second, we find that factor prices could move in a direction opposite to the one accepted as conventional wisdom following an increase in longevity, depending on the corresponding change in the age-productivity profile. "Women's Household Preparation for Retirement at Young and Mid-Adulthood: Differences by Children and Marital Status"
There are increasing concerns about whether Americans are saving enough for retirement. Recent research has called for improved understanding of the relationship between family structure and economic preparation for retirement at earlier stages of the life course. Using multiple years of the Federal Reserve Board’s Survey of Consumer Finances, we examined how number of children and marital status were associated with women’s household retirement savings at young and mid-adulthood. Several household-level indicators of retirement preparation were considered: desire to save for retirement, retirement account ownership, eligibility to participate in a defined-contribution plan, participation in defined-contribution plans, and retirement account wealth. Results from regression analyses revealed variation in women’s household financial preparation for retirement at young and mid-adulthood by family context. Additional children were negatively associated with several measures of retirement preparation among single-female households but not for couple households. Overall, we found that low economic preparation for retirement is an additional economic disadvantage facing single mothers at young and mid-adulthood, with potentially long-term implications for their financial security. The results shed light on linkages between family structure and women’s economic status. 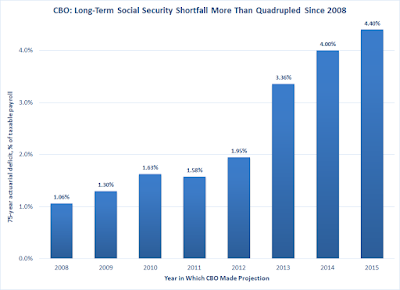 Social Security: Is the GOP Scared of the Issue? Social Security is not just a gray hair issue. Millennials are not only a major force as voters, but the massive generation now comprises the majority of the American workforce. And one thing all workers take note of -- all of the deductions from our paychecks. We’re all paying into the Social Security system; the question is: What will we receive in return tomorrow for every dollar that’s taken out of our paycheck today? And when do we get our money back? Republican presidential candidates are already stirring voters with talk of raising the national retirement age. Presidential candidate and Florida Governor Jeb Bush says Social Security benefits need to be delayed to age 68 or 70. New paper: "Not All Disabilities Are Alike: Implementing a Rating System for SSDI." The National Center for Policy Analysis released a new paper by Pam Villarreal, "Not All Disabilities Are Alike: Implementing a Rating System for SSDI." Despite today's workplace accommodations for the disabled, improved diagnoses and treatments, and less physically demanding jobs, the number of individuals receiving disability payments has increased dramatically over previous decades. Prior to 1990, the annual percentage of workers receiving benefits grew about half a percent per year. There were 10.2 million individual disabled workers, disabled widowers or disabled adult children receiving Social Security Disability. Disabled beneficiaries ages 18 to 64 were 4.8 percent of the total nonsenior adult population. The average beneficiary age was 53 years and the average monthly benefit was $1,146. Restructure the all-or-nothing payment system to reflect varying degrees of disability, as does the Veterans' Disability system. A lower level of benefit payments could be awarded to individuals who have a higher probability of improvement. Eliminate the "Ticket to Work" program and lift the maximum monthly income limit for work. The current SSDI system offers a voluntary "Ticket to Work" program in which beneficiaries can work for up to three years without losing their disability benefits. However, the program had little effect on beneficiaries returning to work. In exchange for a reduction in payments due to rating disability by degree, the monthly maximum limit on labor income ($1,090 in 2015) that disqualifies a beneficiary from receiving disability benefits could be eliminated. 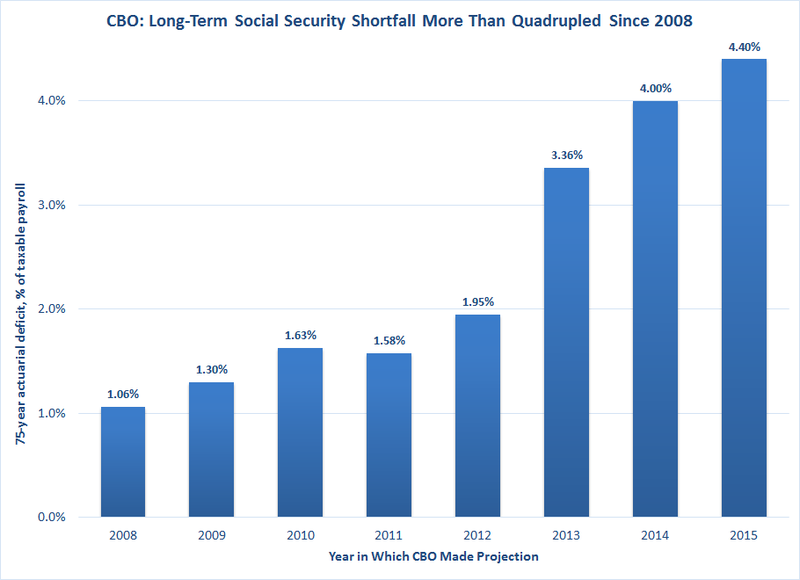 My first piece over at Forbes focuses on the CBO's new projections for Social Security, which show a substantially larger long-term deficit compared to previous years. Will this spur Congress to action? “Does Mortality Differ Between Public and Private Sector Workers?” by Alicia H. Munnell, Jean-Pierre Aubry, and Geoffrey T. Sanzenbacher. Blahous: "The Social Security Trustees Respectable Projection Record"
Over at e21, Social Security Public Trustee Chuck Blahous writes about the accuracy of the Trustees' projections, in the wake of a two recent papers by several academics claiming that SSA's SSA actuaries, who are very influential in setting the Trustees' assumptions, have made significant and one-sided errors in recent years. Blahous states, "As a currently-serving trustee I have been asked for my view of the Kashin-King-Soneji work. Summarizing very roughly, their factual observations and analyses strike me as essentially correct, though I disagree with many of their interpretative conclusions." Blahous makes several valuable points. He notes, for instance, that while the Kashin-King-Soneji papers focus on Social Security's mortality assumptions -- that is, projections of how quickly life spans increase -- these are only a small part of the many factors that influence social security's finances. Other factors, in particular the Great Recession, caused much larger errors in projecting Social Security finances.The papers are really one some very narrow demographic issues in the Social Security projection process, but are generalized to the broader conclusions drawn by Social Security's actuaries and trustees. On the other hand, I can't help but think that some of the qualitative points made by Kashin-Kind-Soneji -- that the processes for setting these assumptions and doing other calculations regarding Social Security finances are too closed, secretive and turf-conscious, and that there's a (perhaps undue) emphasis on not making significant changes to these projections from year to year -- are true and important. From my own experience at SSA, which included several years in the inter-agency working group that helps construct the Trustees Report, it's an odd process. Some of their criticisms are harsh, at times overly so, but they do convey something of the flavor of how things work at SSA. Finally, the Kashin-King-Soneji papers -- which focus on SSA's longevity assumptions -- reminded of a chart on disability projections contained in 2014 Congressional testimony by Richard Burkhauser, a disability expert at Corner who's also affiliated with the American Enterprise Institute. The chart shows the Trustees' projections of disability beneficiaries as a percentage of the working-age population relative to what actually occurred (the solid black line). These projections go back several decades, far before the post-2000 period the Kashin-King-Soneji papers study, but there is a pattern of underestimating the growth of the disability population. Relief from disability costs, it seems, was always right around the corner. 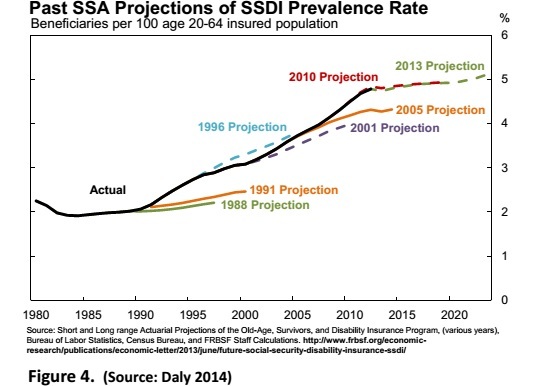 If most of the growth of the DI was from predictable demographic causes, which is the SSA actuaries' argument, you'd think the increase would be more easily foreseeable. "Labor Market Shocks and Early Social Security Benefit Claiming"
Many job-losers suffer large and persistent losses in earnings capacity. For displaced workers who are age-eligible, one reaction to these losses is to begin claiming Social Security retirement benefits. We use administrative earnings records from the Social Security Administration’s Continuous Work History Sample to study the impacts of labor market shocks among workers in their late 50’s and early 60’s on Social Security retirement benefit claiming rates. We find that labor market shocks lead to current and future increases in the fraction of insured workers who initiate Social Security benefits at the earliest possible claiming age. Moreover, once they initiate benefits, early claimants continue to have low levels of earnings in all subsequent years. "Determinants of Expected Returns at Public Defined-Benefit Pension Plans"
Estimated expected returns are important for pension plans, as they influence many plan characteristics including required asset levels, annual contributions, and the extent of plan under- or over funding. Yet, there seems to be little prior literature on the factors influencing these estimated future returns. In an attempt to fill this gap, this paper presents the results of a panel analysis of data on the determinants of such returns used by US public defined-benefit (DB) pension plans for the period 2001-2011. As expected, we find that real return estimates by DB public pension funds are positively related to fund size, fund age, international asset diversification, state income, and corruption levels. However, more interestingly and importantly, we document that real return estimates by public US DB pension funds are positively related to cultural measures of individualism and masculinity, and negatively related to uncertainty avoidance. These results should be of much interest not only to scholars and pension beneficiaries, but also to fund managers, other capital market participants, and policymakers. "Ageing in India: Need for Universal Pension Scheme"
Economic & Political Weekly, May 2, Vol. 50(18), 41. India has low pension coverage, and the pension system is unable to fulfill its purpose. A non-contributory, basic pension can guarantee a regular income in old age to all residents of the country, regardless of earning or occupation. The feasibility of introducing such a pension in India is explored in this paper. It is argued that a properly crafted universal pension scheme will increase the coverage of pension without putting stress on the fisc. This Newsletter features the April 2015 MRRC Researcher Workshop at the University of Michigan in Ann Arbor. The Workshop is an annual event. MRRC held its researcher workshop April 17 and 18, 2015. Thirty-five researchers presented work-in-progress and received feedback and answered questions from attendees. Enacted by Congress in 1998, Section 508 refers to laws requiring federal agencies to make electronic and information technology accessible to people with disabilities. In April the Social Security Administration released the 2014 Annual Statistical Supplement on its website.